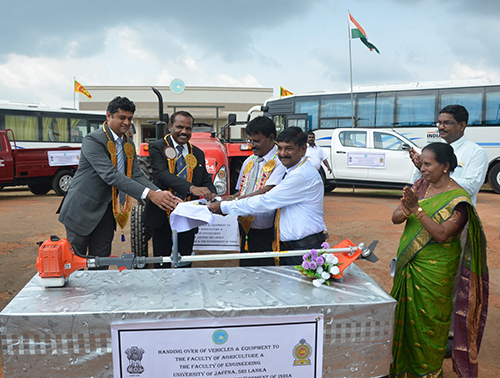 A grant assistance package of vehicles, equipment, machinery etc. 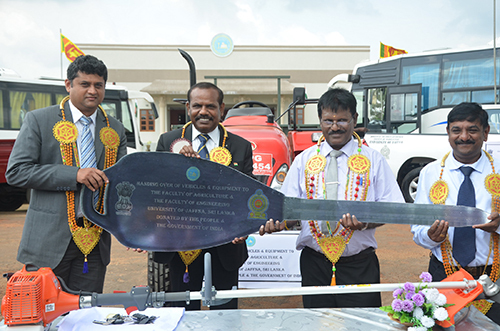 meant for the faculties of Agriculture and Engineering of Killinochchi Campus of University of Jaffna was handed over to the University in a ceremony held on October 23, 2017 at the Killinochchi Campus. Consul General of India in Jaffna Mr. A. Natarajan and Mr. D.C. Manjunath, Head of Development Cooperation Wing, High commission of India in Colombo handed over the material to the Vice Chancellor of the University Mr. R. Vigneswaran. Deans of various faculty, other faculty members, officials and students participated in the ceremony. In addition to provision of equipment, vehicles etc., the Government of India will also provide support for curriculum development, faculty exchanges, training and research. The project will benefit students pursuing professional courses in Agriculture and Engineering by providing them better facilities and improved learning environment.